We are living and aging through the years without you. Audrey’s third birthday is tomorrow. Even though it’s only her second birthday without you, tomorrow she will have had more without you than with you- well, if you don’t count her actual day of birth- the day we welcomed her into the world together- as a couple- the day we became a new family. There is still no continuity between that world and this life. I have searched for it and given up. I tell myself to embrace this world- whatever it is. I am a mother. I am a woman. I live in the year of 2011 on this planet. I try to will myself to just enjoy this life as a separate, totally different life than the other one. But I fail at this. Three years- three years- that’s all it has been since I lived in a Brooklyn apartment and went into labor with you, my husband, tears and nervousness about what was to come in your eyes at the kitchen table, “I love you…” Three years. I live in a different state. I have a three year old. (This one makes sense) I am a widow. Certainly one of the toughest things about the last fifteen months of grieving is that we had no set routine to fall back to after we buried you. I had no job- no career even. Audrey wasn’t in school or daycare. It was waking up each morning trying to come up with a plan. There were lots of days with visitors; there were many trips to the library, Target, and walks along the Hudson. But I felt almost like I was running from being in the house every day. I had to get out. “It’s a beautiful day,” I’d hear. “I must take my child out,” I’d think. And so I did. Because of you my dear sweet girl, the first year of my widowhood included raspberry picking and apple picking, and getting up at 5 am to go see the Macy’s Thankgiving Parade from the upper west side. It included keening in showers and sobbing late at night, but it also included birthday parties with pizza, cake, and your head in a pointy pink party hat. It included a trip to Virginia and Arizona and Maine- more crying late at night this time in strange beds in hotels or the homes of friends, but also your first train ride, teaching you the word cacti, and visiting a lighthouse. Now it feels like the gateway to your life Audrey. 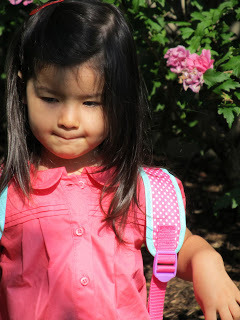 You are turning three- you started preschool last week. No more filling up fourteen hour days with things to do when I felt I could barely get out of bed, no more self-imposed structure- dragging myself out of bed each day to do play dough and painting and cry while I walk behind the stroller. Now there is a structure again- the world reminding me it is still there and will kick me along. I am happy for the kick as it feels much better than dragging. My dear Audrey- thank you though- for giving me a reason to get up each day- for giving me a year littered with happier things- and mostly filled with you. I want you to know how grateful I am and how much your father loves you too. You may forget every single detail about him- you may not remember his voice or the color of his eyes or the way the scruff on his chin felt against your head or fingers, but you will know this – that he loved and loves you still. That I am finding is really the same story that the Bible tells- the Old Testament is full of all the stories and rituals- like the ones I tried so hard to do with you in the early days- but the New – the New Testament, reminds me so much of what I hope you’ll know of your dad- just that he loved you and would’ve given his life for you. It’s all important- but if the first part is just too complicated and hard to remember- the Old- then just hold onto the new- the love that overcomes death itself. I will go now and wrap little presents for a birthday “treasure hunt” from the birthday fairy which, I have made clear, is me, lest I get no credit for Christmas or birthdays. I will write her a card and put together little goodie bags for the children in her class. I will wonder if my joy, even in my child’s birthday, can ever be complete again- not laced with such tremendous grief. I wonder what this feels like, to celebrate your child’s birthday without the sadness of all that is missing. If it is possible, and it seems that it should be- in this grieving world exploding with paradox- with joy incomplete, and at the same time, with complete joy- I will celebrate our daughter tomorrow. Because she deserves nothing less. This left me breathless. Happy Birthday, sweet Audrey. Beautiful, beautiful girl. May your day be filled with magic, Audrey. And may your day, Julia, be filled with love and comfort from the heavens. Close your eyes and feel Dan's love raining down on you. Again and again, Julia, you amaze me. Happy Birthday Audrey. We love you! Happy birthday precious Audrey. You are so precious and wonderful. Julia, you are a great mom. Audrey, happy birthday. Happy birthday, Audrey. Hope the birthday fairy brings you exciting treasures!